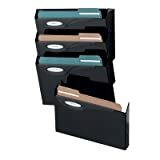 Contains one basic filing pocket and three add-on filing pockets. 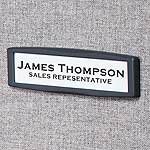 Includes Deluxe Hot File Labeling System to add functionality. One easy-to-apply label holder packet included with each pocket. Required wall area is 20-1/2" high from top of panel by 13" wide. These wall files are streamlined for style and versatility. 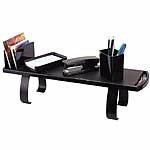 Sleek rounded design great for contemporary offices. Narrow depth makes them ideal for offices with limited space. 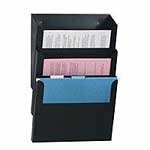 Each pocket includes Deluxe Hot File labeling system to easily identify file contents. The latest in wall file design incorporates the features you want to improve your productivity. Extra capacity to hold more documents; up to 3-5/8". Bin connectors allow the space to be adjusted between the files for taller or shorter documents. Modern design allows for easy file accessibility. Softer edges eliminate cuts and scratches. Textured steel file pockets attach to any door or wall. Organize home or office with the contemporary look of sturdy rolled steel mesh accessories. Sleek styling coordinates with many decors. 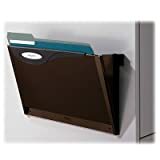 Durable file mounts flush to wall with included hardware. Modern arched design allows for easy access to files. Holds documents and folders up to 13-1/2" wide. Add-On pocket mounts to existing pockets (RUB16621, RUB16623, RUB16673) to expand your filing capacity. Add additional bin connectors to expand Ultra Hot Files into a system. 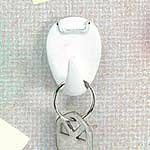 Partition hangers allow pockets to hang in cubicle. Use partition hangers with Ultra Hot Files, Stack-a-File or Rubbermaid Unbreakables. Transparent acrylic holder offers a clear view of brochures and pamphlets. Mount on wall (hardware not included) or stand on flat surfaces. 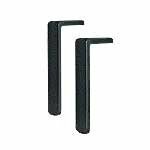 Attaches to file cabinets and other metal furniture to maximize office space. Holds up to 3 lbs. of files.